Chinook C.V., a subsidiary company of Nuon, has been awarded the permit to construct and operate the wind farm at Sites I and II of the Hollandse Kust (zuid) Wind Farm Zone without subsidy. The wind farm in the Dutch North Sea will provide enough sustainable electricity for one million households. Applications submitted for the tender round to build the wind farm without subsidy were assessed in recent months, with the plan from Nuon&apos;s subsidiary company receiving the highest score. The new wind farm should be ready in 2022, which will make it the first in the world to be constructed without subsidy. Minister of Economic Affairs and Climate Policy for the Netherlands, Eric Wiebes, presented the permit today to Gunnar Groebler, Vice President of Nuon&apos;s parent company Vattenfall. Wiebes did so during his working visit to Ampelmann and HSM Offshore, two Dutch companies which are global leaders in offshore wind energy. Chinook is a limited partnership and a subsidiary company of Nuon/Vattenfall. In 2007, Nuon and Shell constructed the first Dutch offshore wind farm, Egmond aan Zee (OWEZ). Nuon/Vattenfall have constructed wind farms totalling 1.6 GW, with another 6.5 GW planned or under construction. In terms of market share, this makes Vattenfall the fourth largest owner of offshore wind farms in Europe, after Ørsted, E.ON and Innogy. The company has had significant success in Denmark recently, winning the last three national offshore wind farm permit tenders there. Vattenfall&apos;s offshore wind farm potfolio spans Sweden, Denmark, Germany, the United Kingdom and the Netherlands. 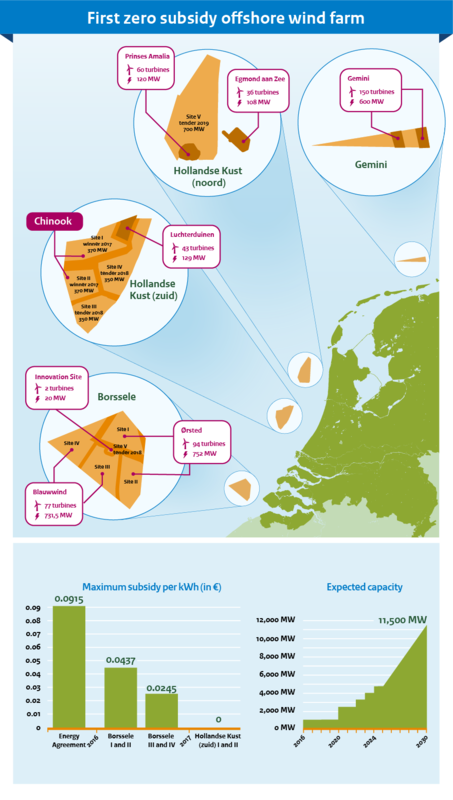 The Dutch government is on course to achieve its offshore wind ambitions. The cost price of offshore wind has dropped spectacularly in recent years. Compared to the €0.124/kWh price assumed in the 2013 Energy Agreement, a cost reduction of 55% has been achieved in the last permit procedure, which means it is now possible to construct and operate a wind farm without subsidy. Including Hollandse Kust (zuid) Wind Farm Sites I and II, over 60% of the total 3,450 MW of new offshore wind planned under the Energy Agreement has been awarded to market parties and will, when fully operational, provide enough sustainable electricity for three million households. From 2-18 January, another permit procedure took place concerning the development of Borssele Wind Farm Site V. This site is specifically intended for innovation and testing new technology. The site winner will be announced by end April. 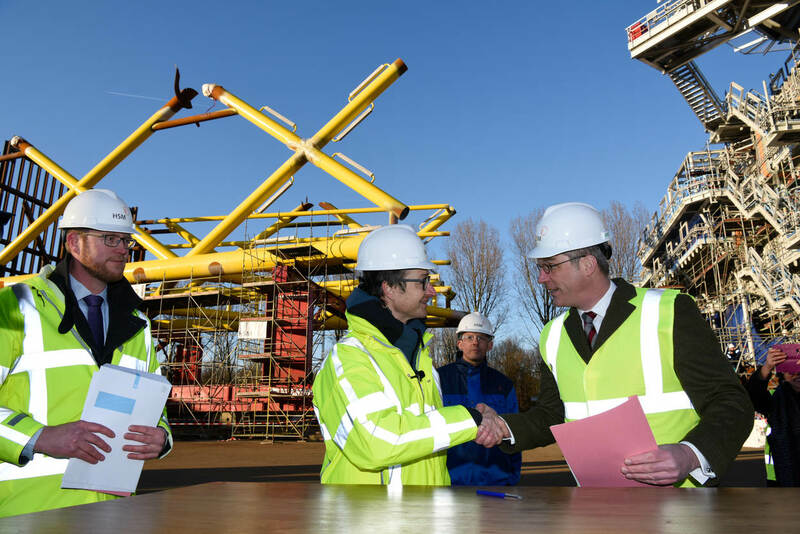 The Netherlands is building offshore wind farms. Today Chinook C.V., a subsidiary company of Nuon, has been awarded a permit to construct and operate the windfarm at Sites I and II of the Hollandse Kust (Zuid) Wind Farm Zone without subsidy.